Customers are always surprised by some of the book titles that appear in our displays for Banned Books Week. One of the most common questions we get is, "Why would anyone try to ban Captain Underpants?" 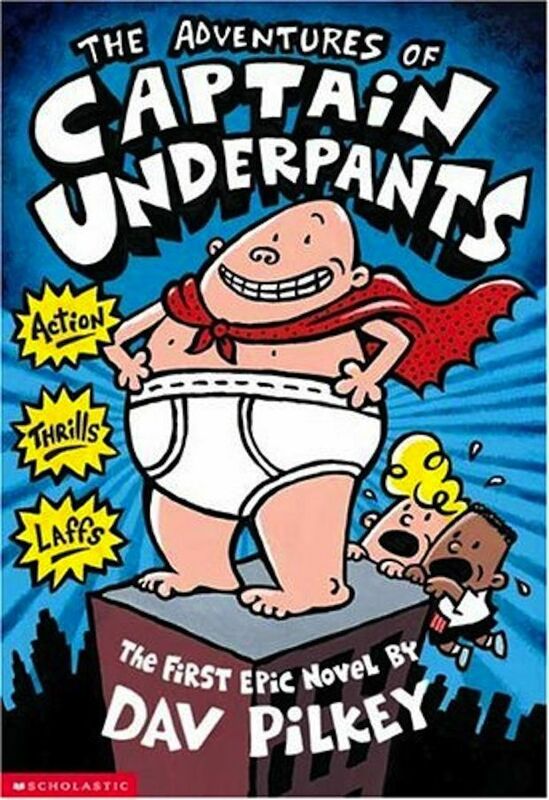 The Captain Underpants series by Dav Pilkey appears as the number one challenged book for 2012, according to the American Library Association (ALA) Office for Intellectual Freedom. Captain Underpants is a very popular series with beginning readers, but it is often requested to be pulled from reading lists and school libraries citing offensive language. The American Library Association's annual State of America's Libraries report includes a listing of the top 10 challenged books for the previous year. A challenge is defined as a formal, written complaint filed with a library or school requesting that a book or other material be restricted or removed because of its content or appropriateness. In 2012, the ALA received 464 reports on attempts to remove or restrict materials from school curricula and library bookshelves. This is an increase from 2011 totals, which stood at 326 attempts. Since we started working for bookstores, and now owning our own, we look forward each year to setting up a display for Banned Books Week, which this year is running September 22nd through the 28th. We love the opportunity to talk to customers about why certain books are challenged or banned. We also love to share the history of book banning. Our store display includes many titles that have been banned at different times, including religious texts like the Bible or the Koran. Firefly Bookstore strongly defends the individual's right to read, while advocating a conversation between the public and local schools and libraries. We are hoping with our display to talk about the debate as much as talking about the right to read these books. As schools build curricula that feature both current and classic material, teachers and librarians occasionally run into complaints from parents and the public about certain books. One local example happened in 2012, when the Emmaus High School received a complaint about the summer reading list that included Prep by Curtis Sittenfeld and Tom Wolfe's Electric Kool-Aid Acid Test. A formal complaint brought by one parent prompted the school district to review the titles for appropriateness. For us, this is the conversation that we want to see happen. It's important that communities are aware of these challenges, and talk about them. In the past, communities in many times and places have tried to have books removed entirely. Here in America, classics like Huckleberry Finn and To Kill a Mockingbird have been attacked repeatedly. Often challenges succeed because the community is unaware of a problem. A school district or library may remove a book simply to avoid a confrontation with one parent. 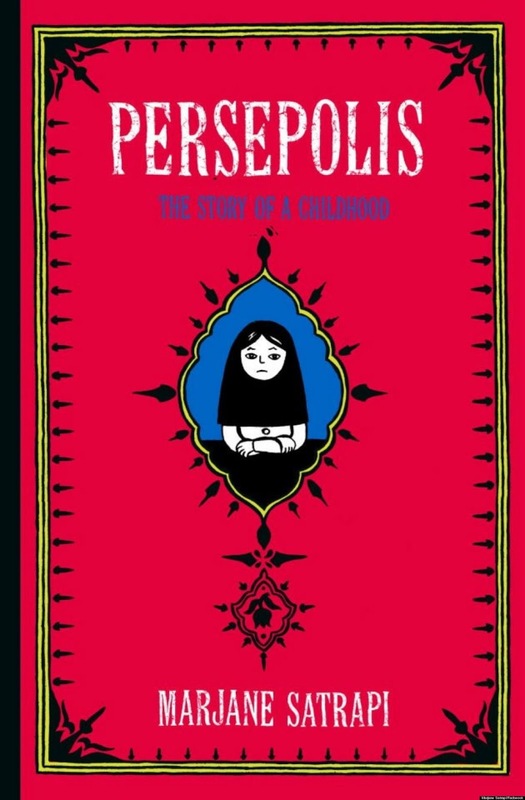 Just this year in Chicago, the graphic novel Persepolis was withdrawn from some class reading lists for graphic and violent images. The Chicago Public School administration claims that the entire issue was a mis-communication. The author, Marjane Satrapi was drawn into the debate and was forced to defend what had been characterized as images of torture. The CBLDF sent a strongly worded and detailed letter refuting the school district's position on the event. This was signed by 5 other organizations and sent to the CPS. The fact is, sometimes these controversies are a result of an administration making changes without debate, discussion or even due process. It's understood that not every title will be chosen for a reading list, and that some titles are more appropriate for older readers. The process becomes corrupted when administrators fail to make changes openly and transparently. In our opinion, withdrawing a text because of a complaint would certainly be cause for review and oversight. Many current titles have been challenged in several US school districts, including The Perks of Being a Wallflower by Stephen Chbosky, Nickle and Dimed by Barbara Ehrenreich and The Kite Runner by Khaled Hosseini. Our view is that these and other books are part of our culture, and should always be available to those who want to read them. We will always defend accessibility. For a guide to currently challenged and banned titles, check out Books Challenged or Banned 2012-2013 by Robert P. Doyle (this is a link to a free, downloadable PDF). Ultimately, Firefly Bookstore wants the public to celebrate the freedom to read. By highlighting the books that have been challenged, we want to help our community understand and recognize one of our most treasured individual rights. The debate itself is important, but as long as even one person wants to read a particular book, we want to ensure that they can. 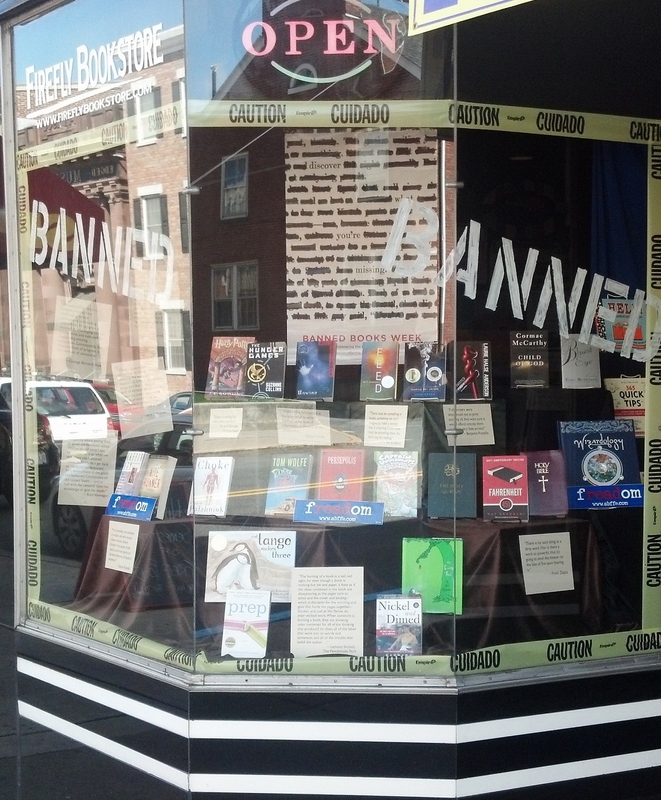 The Banned Books display will be at Firefly Bookstore through the first week in October. For more information about Banned Books Week, check out www.bannedbooksweek.org and www.abffe.org (American Booksellers Foundation For Free Expression). For more information about the American Library Association, go to www.ala.org.